Background and Objective: Coeliac disease (CD) is a chronic autoimmune intestinal disorder characterized by intolerance to gluten, a protein contained in certain cereals. The main physiopathological basis of CD is the progressive destruction of intestinal villi caused by gluten ingestion by genetically-susceptible individuals. Patients who receive a diagnosis of CD must make significant changes to their daily habits and this can affect their quality of life. The objective of this review is to summarize the evidence regarding the economic, physical and social limitations which can affect the quality of life in patients with CD. Results: Different factors such as physical changes, psychological effects, interpersonal relationships, emotions and economic difficulties can affect the quality of life of these patients. Observations suggest that, in general, women with CD experience a greater deterioration in their quality of life than men. Lastly, complications in daily life are also associated with the reduced availability of gluten-free products which also usually cost more than standard products. Conclusions: Continuous health education and care regarding socio-economic issues should be continuously developed and provided to people with CD. 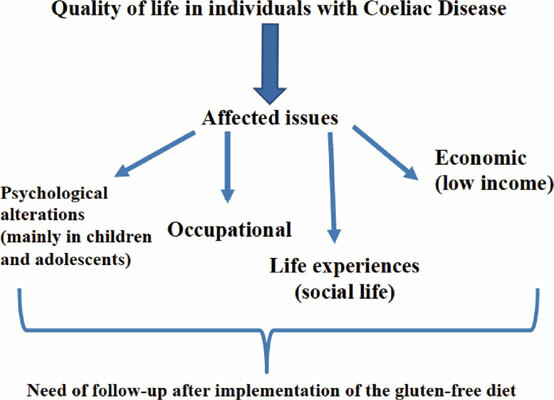 Coeliac disease, quality life, anxiety, gluten-free diet, depression, economic burden, children, adolescent.